A robotic football team representing Scotland will compete against other countries in the Robocup contest in Turkey next year. Android FC, made up of a two-foot-high striker, defender and goalkeeper, will compete in the contest in Istanbul. 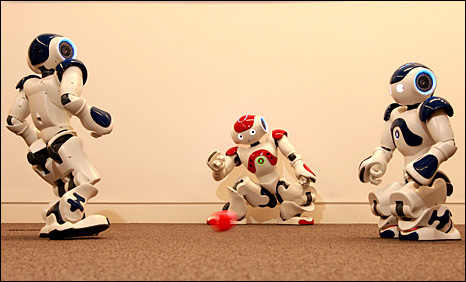 The robots, which have been developed by academics at Edinburgh University, can make sense of its surroundings and react to other players' movements. Craig Levein will be watching with interest. Easter weekend. Anybody in Scottish football in need of resurrection? Falkirk? Celtic? The whole national game? Miracles are a bit thin on the ground these days so I suppose it's just another weekend of watching the usual fare. We might expect Hearts to ship four to Rangers, even for a faltering Hibs to lose four against Dundee United. But for Celtic and Rangers to get cuffed by St Mirren and St Johnstone. It's been a topsy turvy time of late. So what can we expect this weekend from our top division? Motherwell v Falkirk. Home win. If it gets a bit dull Fir Park might be a good place to roll your Easter eggs. Rangers v Hamilton. Home win. Rangers were embarrased and angry in midweek. Insert your own Hot Cross Buns joke. St Mirren v Hearts. Draw. You could go to this match. Or you could save your 30 pieces of silver. Hibs v Celtic. Away win. John Hughes is not the Messiah. He's a very naughty boy. Kilmarnock v Aberdeen. Home win. Aberdeen fans thought Jimmy Calderwood was Pontius Pilate. Have they replaced him with Judas? St Johnstone v Dundee United. Draw. Game of the weekend. The Gospel of Derek v the Gospel of Peter. The stats so far. Missed last week and can't be bothered going to back to check at the moment. Exhausted myself with tenuous Easter related one liners that didn't even make me laugh. A hard life, right enough. So what's going to annoy Rafa Benitez more? The red card, the dodgy referee, the defeat? Or that the goalscorer appears to be Gordan Petric's uglier older brother? Part Three of STV's Greatest Team. Unfortunately I missed it because my holiday - which regular readers will be pleased to know is now back on track - is outside the STV region. Thankfully, displaying the kind of determination that brought Heather Brooke the MP expenses scandal scoop, I have been able to track down the shortlist of defenders that Kelly Dalglish-Cates brought viewers tonight. I did this by looking at the STV website. I have no doubt that a Pulitzer is in the post. I'm keeping my powder dry vis a vis choices for a while longer yet. Except to say that if Danny McGrain isn't in your final back four then there's something wrong with you. Next week 'keepers (I fear the shortlist will further depress Hibs fans - see how mighty you once were!) and managers. Another month, another club looking like it's about to disappear. This time Cowdenbeath. A historic name in Scottish football about to become a historic relic. A club that has never achieved much but seems to make Scottish football just that bit more reassuring simply by being. Sadly they play at a ground they can barely afford, on a pitch that is too small, surrounded by a stock car track that makes more money than the football club. Scottish football has come to this. The most depressing thing about all this: it's just a cycle that we're too bloody stupid to stop. Cowdenbeath go bust, the SFL will invite somebody else to fill their place and carry on as usual. The SFA have put a licensing system in place to ensure a certain quality of ground. If teams can't afford to comply they get fined. Because obviously most of our lower division clubs are the footballing equivalent of Lord Ashcroft. They could afford to pay the SFA's arbitary football tax but they choose not to. Because, well, there's others that can pay. The most sickening thing I read about this whole situation was the SFA's reaction. Summarised simply as: "hell mend them." Because the small minded idiots that are running this game love rules more than they love football, love the miserable thrill of power they get from causing misery more than they appreciate the idea of actually giving Scotland a football league that might actually do any more than encourage the game to stagnate. So the SFA make their demands. And if you can't meet their demands then you'll be fined. Because they are the governors and you are only the football clubs trying to keep the game alive in communities that don't have much else going for them. Too simplistic? Possibly but for all their talk of the Scottish Football Partnership, the SFA are actually doing more to harm some of these teams than they are to help them. The footballing equivalent of a hospital full of Harold Shipmans. How can that be right? The SFL simply shrug at every casualty and promptly elect another club to take their place. The footballing equivalent of First World War generals. How can that be right? The story of Cowdenbeath is of more than a football club breathing its last. It's of Scotland's national game being slowly poisoned by the bodies that claim to govern it. And how can any of that be right? I've only been keeping one eye on the fitba' this week because the weather's been much more interesting. Clearly this is not the case if you're a fan of St Johnstone or Dundee United. If, like me, you were supposed to embark on your first camping trip of the spring yesterday, the sudden onslaught of snow, rain, wind and general crappiness has proved mildly diverting. Thus I find myself updating you from the room of a rather pleasant bed and breakfast establishment overlooking the Solway Firth and protecting me from the howling wind. Actually this has turned out to be something of blessing as the comfort of being indoors is providing more succour to the badly poisoned foot blister I have somehow developed than sheltering under canvas. This has not yet been the Easter getaway of my dreams. Anyway, football carries on regardless. Congratulations are due, of course, to St Johnstone, the SPL's midweek kings, for their splendid 4-1 win over Rangers. Obviously this will change the outcome of the SPL not one jot. It might just get St Johnstone on the run that will get them to the top six though. And it will give the St Johnstone supporters something to laugh about for, ooh, the next sixty or so years. Tonight Dundee United completed the second part of the "Battle for Third" double. With Motherwell beaten on Saturday, United finished the job with a 4-2 win at Easter Road. They look certainties for third now. And who is to say, if Neil Lennon does not have the answers at Celtic Park, that United won't yet end up in a battle for second place? That scenario is surely as heartening to the neutral as hearing that final score from Perth on Tuesday night.